When Olivia Newton-John was born back on 26 September 1948, Australians were a nation of pineapple enthusiasts. Pineapple featured in hors d’oeuvres, mains and our desserts. Potatoes and eggs came in a close second when it came to star ingredients. Let’s take a look at what was happening around this time when our beloved Olivia came into the world. SEVENTY YEARS AGO, Ben Chifley was three years in as Australia’s well loved Prime Minister with Sir Robert Menzies at his heel, ready for his second era. Petrol rationing was in place and Chifley was insisting it stay in place for the foreseeable future. The good news for Australians as we moved out of the rationing years during the Second World War was that sugar and meat rationing had come to an end by 1948. Food consumption was really starting to look up in Australia, although butter was still rationed up until 1950. Moving out of years of restrictions on ingredients explains our national love of pineapple in the 1940s. It grew well in our tropics, it was sweet when sugar was hard to come by, and it added colour and vibrancy as we moved out of a dark period of world conflict and mass bereavement. What were we eating in the late 1940s? Meals remained plain in comparison to today. Stews, roasts, breads, scones and simple desserts such as stewed fruits and custard, were staples for meals. Meats and offal, potatoes, pineapples, dried fruits, eggs, milk and flour – were key ingredients. The nutritional value of ingredients was just starting to become a focus for government bodies. 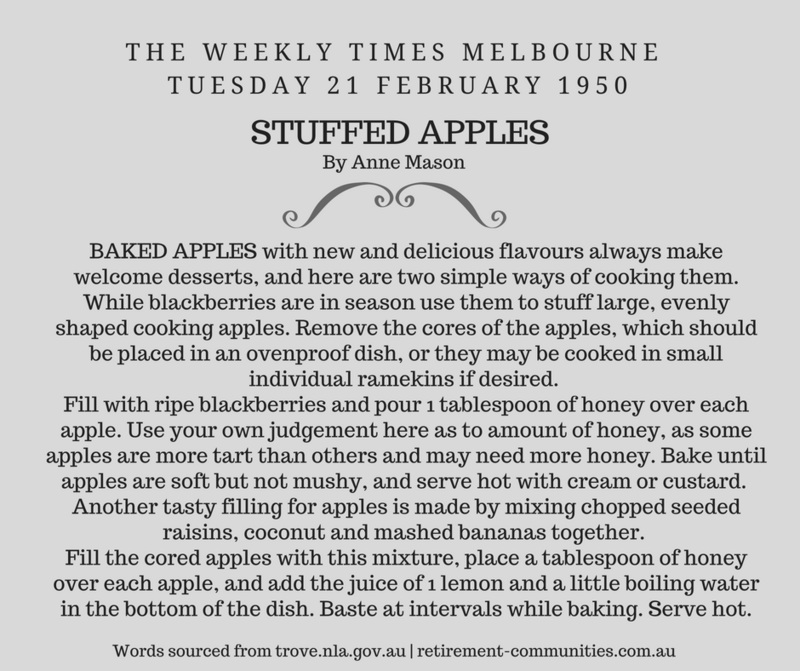 Interestingly a browse of salad recipes in Trove ⎯ the National Library of Australia’s online knowledge sharing platform ⎯ was very limited. In fact one Melbourne newspaper article from the 1940s suggested that provided your lettuce was crisp and your salad dressing plentiful, your salad was done! Your challenge is to recreate these dishes that your parents, or grandparents, may have shared with you, and enjoy the simplicity of flavours, and how economic these meals are! And finally some tips for salad! MAIN IMAGE sourced from the State Library of Victoria’s Digital Image Pool. Description: Shows homelife in unofficial camp set up by men of the Civil Construction Corps at Townsville, Northern Queensland. Gift of The Age (Melbourne) 1976. Jul 9 Join us at the first of our Multi-cultural Celebration Days! Jul 4 FAQs: Who is responsible for the running of a retirement village? Jun 2 FAQs: When is the right time to sell your property?